So, you’ve been together a while, it’s going really well and you’re eagerly hoping your beloved is going to pop that all important question very soon. Or perhaps you’re the proposer rather than the ‘proposee’ and need a little help finding ‘the one’. Halo diamond rings are loved for their vintage-inspired look. Extremely glamorous, this style takes inspiration from the past and is given a modern update. The ultimate in vintage glamour, our Platinum Diamond Halo Ring will take your breath away. The smaller diamonds create the halo and surround the larger central diamond, creating an impressive sparkle. Halo rings are designed for someone who wants something a little different, yet something completely timeless. Cluster diamond rings are a beautiful choice. They’re perfect for the person that loves sparkle. They really are a statement piece, catching attention from across the room. Our Platinum Diamond Cluster Ring is filled with dazzling diamonds so you can sparkle forever. The beauty of this style is that the cluster of diamonds creates the illusion of one large stone. When considering your price range, a cluster of diamonds can be a more affordable option than one very large diamond - but just as dazzling and impressive. Classic, elegant and timeless, solitaire rings will never date. They’re simple, yet stunning with the single diamond taking centre stage. 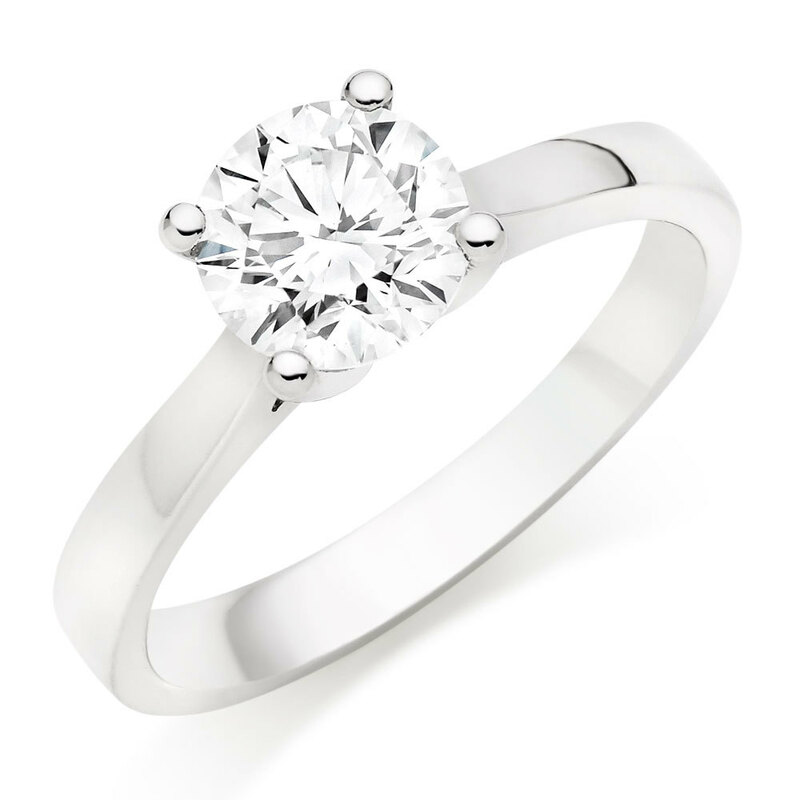 A classic and timeless beauty, instantly fall in love with our Once by Beaverbrooks Platinum Diamond Solitaire Ring. They create endless options when it comes to choosing the wedding ring to match. Add a little more sparkle with a diamond set wedding band, or keep the look simple and sleek with a plain band. A very traditional style that’s lasted the test of time and will always be beautiful, three stone rings are a classic choice that will always be timeless. Our Platinum Diamond Three Stone Ring, showcasing some serious sparkle. Each diamond could symbolise you and your loved one’s past, present and future, making this the perfect style for the hopeless romantic. For the contemporary person who wants something a little different to everyone else, a rose gold engagement ring is the perfect choice. A beautiful colour and very on-trend, we love the warm hues of these rings. Our 18ct Rose Gold Diamond Cluster Ring, perfect for a beautifully modern look. Showcasing a subtle touch of rose gold, our Rose Hearts collection holds a secret message, with a hidden rose gold heart underneath the diamond. A beautiful choice for someone with a modern, yet romantic sense of style and personality. The secret rose gold heart of our 18ct White Gold and Rose Gold Diamond Rose Hearts Ring. This will be the most important and special piece of jewellery that you’ll ever own, so it’s important to go for a style that really suits you and reflects your personality. We're here to help you make the right decision when you choose your engagement ring, so there's even more help at hand in our How To Propose Guide and our Diamond Buying Guide. You want to love your ring for a lifetime and always be reminded of your happiest memories every time you look at it. So all that’s left to decide is…which engagement ring style are you?